The versatile multi-functional Mixidisc S is available in both mounted and trailed versions. The Mixidisc S is designed for high speed stubble cultivation post-harvest to quickly incorporate much larger volumes of crop residues, and create a micro-tilth in the soil for fast germination of volunteers and weed seeds and to create a stale seedbed in one pass. 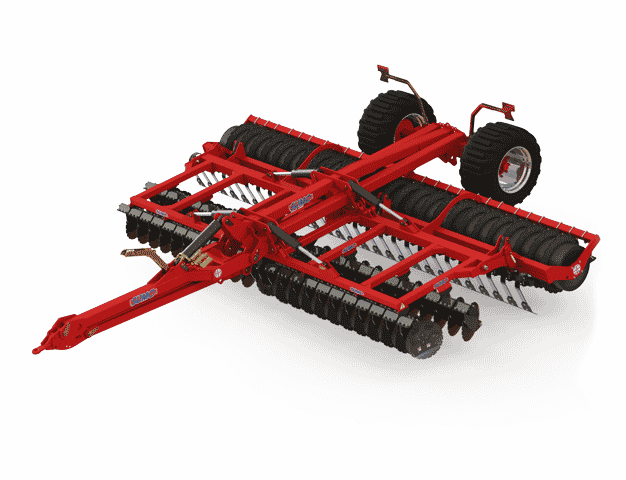 In addition, the Mixidisc S can also be used for seedbed preparation, straw harrowing or furrow leveling after ploughing, with low power requirement. Two rows of independently mounted discs, mounted on shock proof arms, give consistent depth control and turn at an optimum angle designed for mixing, chopping and incorporating residue at high speeds. The discs give unrivaled performance when mounted in pairs on a common axle as they drive each other in adverse conditions and will keep running long after singularly mounted ones have stopped turning. The patented Sumo Multipacka press ensures a firm consolidated weatherproof finish, essential for successful germination of weed seeds.